University Press of Kentucky, 9780813133836, 304pp. 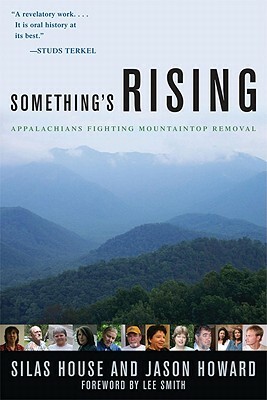 Like an old-fashioned hymn sung in rounds, Something's Rising gives a stirring voice to the lives, culture, and determination of the people fighting the destructive practice of mountaintop removal in the coalfields of central Appalachia. Each person's story, unique and unfiltered, articulates the hardship of living in these majestic mountains amid the daily desecration of the land by the coal industry because of America's insistence on cheap energy. Developed as an alternative to strip mining, mountaintop removal mining consists of blasting away the tops of mountains, dumping waste into the valleys, and retrieving the exposed coal. This process buries streams, pollutes wells and waterways, and alters fragile ecologies in the region. The people who live, work, and raise families in central Appalachia face not only the physical destruction of their land but also the loss of their culture and health in a society dominated by the consequences of mountaintop removal. Included here are oral histories from Jean Ritchie, "the mother of folk," who doesn't let her eighty-six years slow down her fighting spirit; Judy Bonds, a tough-talking coal-miner's daughter; Kathy Mattea, the beloved country singer who believes cooperation is the key to winning the battle; Jack Spadaro, the heroic whistle-blower who has risked everything to share his insider knowledge of federal mining agencies; Larry Bush, who doesn't back down even when speeding coal trucks are used to intimidate him; Denise Giardina, a celebrated writer who ran for governor to bring attention to the issue; and many more. The book features both well-known activists and people rarely in the media. Each oral history is prefaced with a biographical essay that vividly establishes the interview settings and the subjects' connections to their region. Written and edited by native sons of the mountains, this compelling book captures a fever-pitch moment in the movement against mountaintop removal. Silas House and Jason Howard are experts on the history of resistance in Appalachia, the legacy of exploitation of the region's natural resources, and area's unique culture and landscape. This lyrical and informative text provides a critical perspective on a powerful industry. The cumulative effect of these stories is stunning and powerful. Something's Rising will long stand as a testament to the social and ecological consequences of energy at any cost and will be especially welcomed by readers of Appalachian studies, environmental science, and by all who value the mountain's majesty -- our national heritage. Silas House is a bestselling novelist of Clay's Quilt, A Parchment of Leaves, and The Coal Tattoo, whose nonfiction has been published in Newsday, Sierra, The Oxford American, No Depression, and elsewhere. In 2008 he won the Helen Lewis Award for Community Service for his efforts in the fight against mountaintop removal. He teaches at Lincoln Memorial University in Harrogate, Tennessee. Jason Howard is the editor of We All Live Downstream and has written for such publications as Equal Justice Magazine, Paste, Kentucky Living, The Louisville Review, and many others. He is a graduate of the George Washington University and lives in Eastern Kentucky, where he was born and raised.